This was most people’s first exposure to the highly original comic genius of English national treasures Stephen Fry and Hugh Laurie, who wrote and performed many classic sketches. I usually review foreign English-language sitcoms and mysteries here -- not sketch comedies -- but because most Americans have never seen these early TV comedy treasures, I seek to expose as many of you as possible to the 26 priceless episodes of A Bit of Fry & Laurie. You will no doubt thank me profusely after you see some of them. 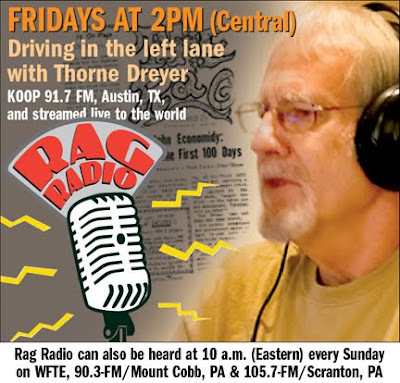 Here is one you can link to. This magnificent English TV series lasted four seasons, from 1987-1995. All the episodes are on Netflix and Netflix Instant streaming and most are free on You Tube. 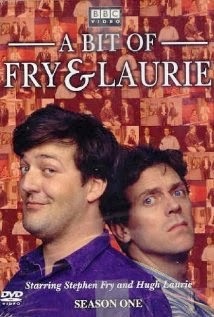 Stephen Fry and Hugh Laurie wrote and performed all the sketches, sometimes with the assistance of Brit celebrity actors such as Rowan Atkinson (Blackadder), Paul Eddington (Yes Minister/Yes Prime Minister); Selina Cadell (Doc Martin ), and Nigel Havers (BAFTA nomination for Chariots of Fire). Hugh Laurie earned two Golden Globes, two Screen Actors Guild statuettes, 10 other awards and six Emmy nominations for playing the title role in House (with a flawless American accent) from 2004 to 2012. In 2011 he was deemed the highest-paid actor in an American TV drama ($409,000 per episode) and was also the most-watched TV leading man. In 2007 he received a cherished OBE award for services to drama. Stephen Fry is an English institution: actor, screenwriter, author, playwright, journalist, poet, comedian, television and radio presenter, film director, and political activist. He teamed up with Laurie when both were at college in Cambridge Footlights. Two of their masterful subsequent collaborations were the hilarious series Blackadder and PBS’s Jeeves and Wooster. Fry has won eight major awards and received 14 other nominations, was kicked out of two schools, was briefly imprisoned for credit card fraud, and had a nervous breakdown in 1995 (after the BBC tinkered with his and Hugh’s show). 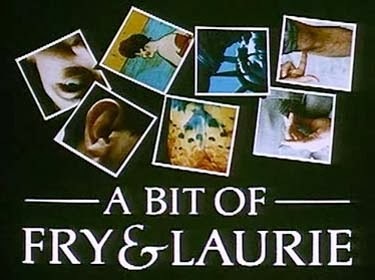 A Bit of Fry & Laurie featured elaborate wordplay and innuendo, political satire, a lot of brilliant nonsense, and Laurie playing piano and singing his funny original songs. In addition, the show was punctuated with non sequitur bits where one of them, usually in weird costume or drag, made odd or droll statements, as was done in Monty Python's Flying Circus. The show often commented on issues of the day. In one sketch a Conservative government minister is strangled while Stephen Fry screams at him "What are you doing to the television system? What are you doing to the country?" in an attack on England’s Broadcasting Act of 1990. The pair later attacked the Act's malign aftereffects in a parody of It's a Wonderful Life, evoking a world in which Rupert Murdoch had not existed. The series made numerous jokes at the expense of Conservative prime ministers Margaret Thatcher and John Major. One sketch depicted a televised "Young Tory of the Year" competition, in which Laurie recited a deliberately incoherent speech consisting only of nonsense political buzzwords, such as "family values" and "individual enterprise." Episodes ended with Fry mixing and describing a bizarre beverage while Laurie sang and played. A very popular song of his was "Mystery," with Hugh mimicking the vocal mannerisms of Sammy Davis Jr. and singing about the obstacles to his relationship with the object of his affection, which included the fact that she had been dead since 1973. A few typical lines follow. Doctor: Frank, this is called inter-oral, extra-nasal respiratory relaxant therapy. As the name implies, it is an American technique. Stephen (as a woman): Well, I was born Mary Patterson, but then I married and naturally took my husband's name, so now I'm Neil Patterson. Hugh: Then I was Princess Anne's assistant for a while, but I chucked that in because it was obvious they were never going to make me Princess Anne, no matter how well I did the job.